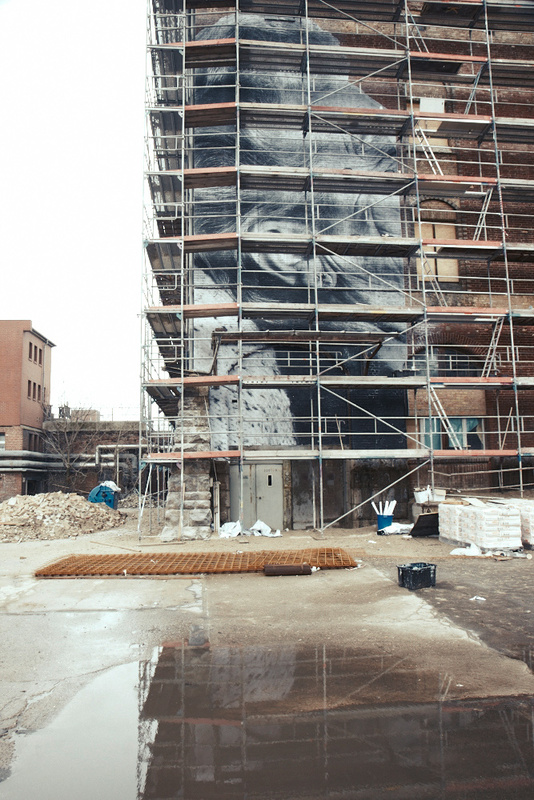 It’s been a week since JR hit the streets of Berlin, working on almost twenty different walls around the city for his current project, Wrinkles of the City: Berlin, opening Wednesday night at Galerie Henrik Springmann. 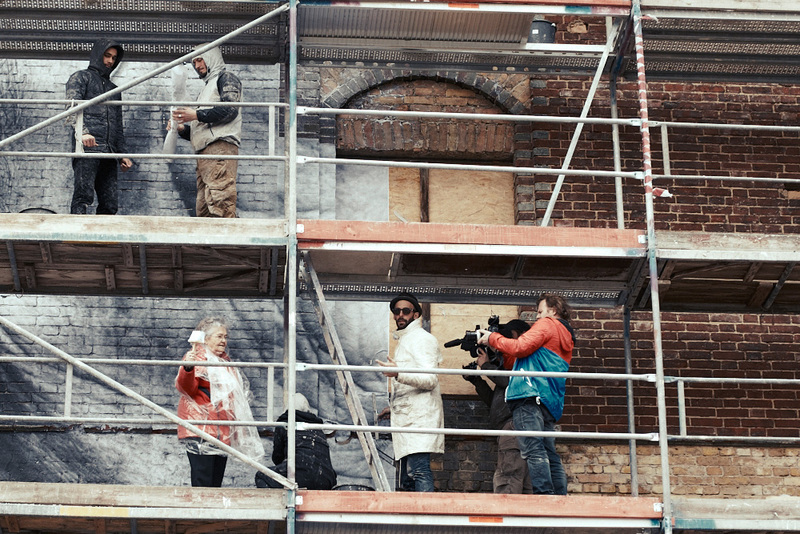 On day four, JR received a special visit from the elderly couple whose portrait is now pasted on the abandoned railway post office turned nightclub, Postbahnhof. The couple, now in their 80s, grabbed a brush and climbed the scaffolding to help with the pasting. Later, AM joined the French artist for an interview about his current projects. 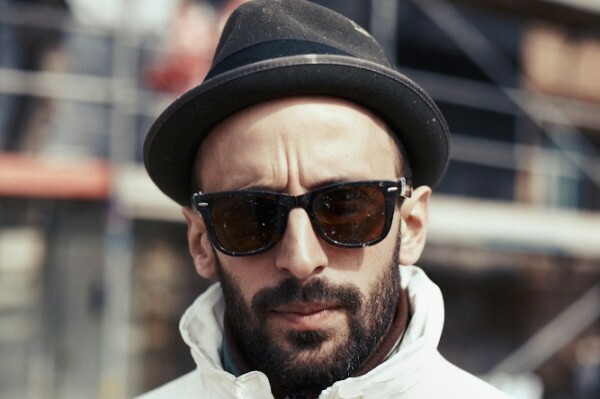 Photo credit: John Brömstrup for Arrested Motion. 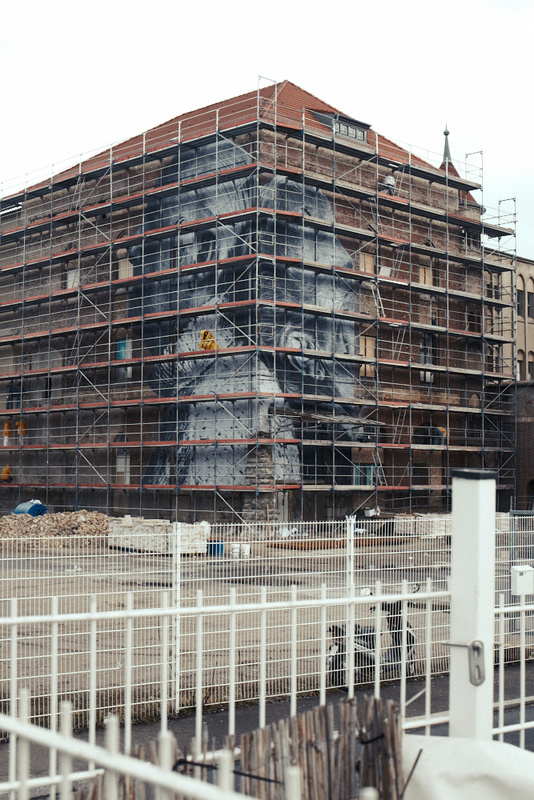 Arrested Motion (AM): Who are the faces you are portraying in your current project with Wrinkles of the City Berlin? Can you tell me some specific stories about some of the people behind the images pasted around this city and why you chose to place them in those locations? 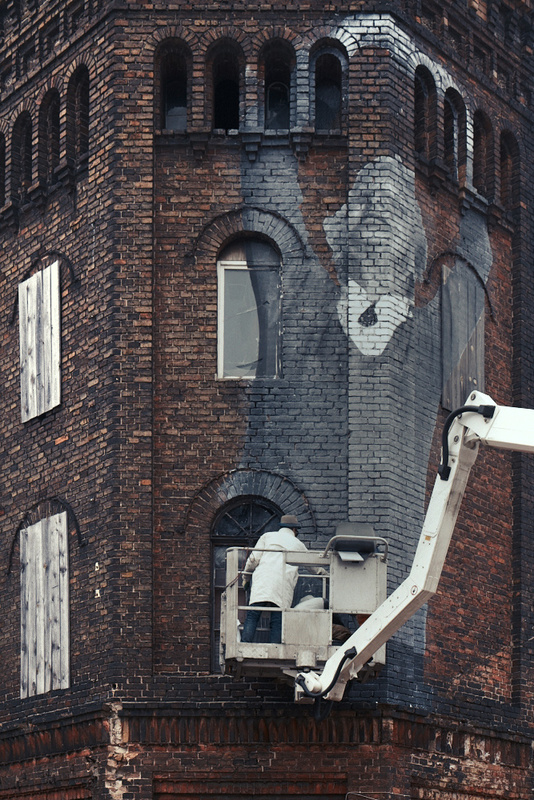 JR: The name of the project is Wrinkles of the City and in each of the places I’ve done it has to be a city where the walls speak for themselves, where there’s wrinkles in the walls. And basically each of the people I photograph have to have wrinkles. They have to be old people and I’m pasting their portraits on the wrinkles of the city. The funny thing is that of course I’m trying to paste on the walls that are linked with their stories but it’s not always easy because of the walls we can find. For example, for this wall, we don’t have authorization. 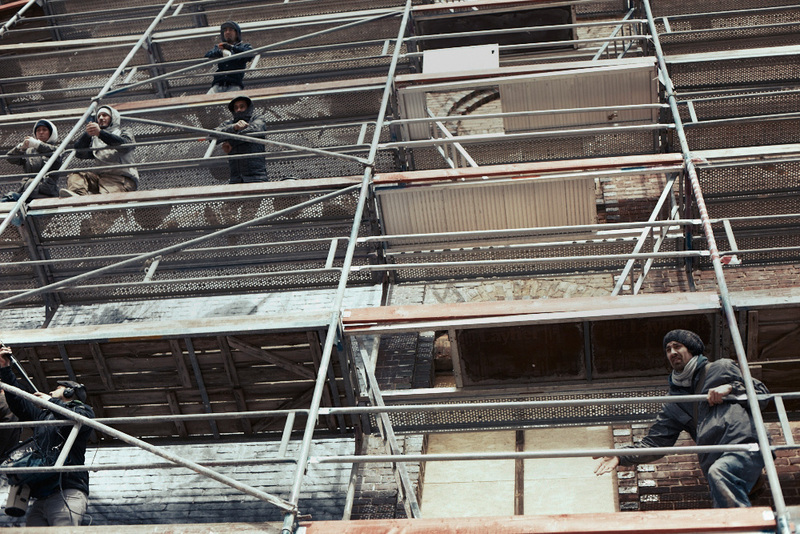 We just came here with the scaffolding and we’re just doing it, like many of the walls we are doing in town. So we’re just pretending we have it, and we don’t even know who is the owner of that building. The funny story is – you know the one we did on the Postbahnhof? The couple we pasted came to paste, and when the woman came, she said that she used to work in that post office, during the separation. She was living on the east side and she was working; forced work for the Stasi, controlling the packages that were going to the west with the resulting really bad memories of that place. And now, she is winning it over by having her face over it. It’s funny how sometimes you don’t know but sometimes things just connect in the city. Because of their stories, because of the fact that those people are more than 80 or 90 years old. They’ve been through many lives in one life, you know? It’s a contrast of generations. They know the city in a way we’ll never get to see it. So they read the buildings in completely different ways than we do. So, maybe this work is the closest I get to the way they read it. But of course, they have seen a different background for that city over the different periods. AM: What I find different about your work is that your work is site specific, in that the images always seem to have a special connection to the place in which they are placed and they wouldn’t have the same meaning if placed elsewhere. What is the significance of that, and why is it important to your work? JR: Because it involves community. It’s local action for local impact. And then of course if it goes global, that’s great. And if people get to know about Berlin that’s great. But the first touch of the project is that it involves people with the city, connects people with the city story. It’s for me a way of learning more about the city and sharing it with the people. So by doing these kinds of projects, people stop, ask questions, participate. There’s a big part of the project that’s not visual, that’s actually the participation of the people. It’s the federation part of it that’s really important to me. So that’s why I think by using really local images of really local people, you touch people in the center of their hearts, in the center of their own town. AM: From all of the places you’ve been to, are there any places that you feel a special connection to? Do you return to the places where you have been, and what is feeling of the place when you return? JR: I mean, I feel like I’m a citizen of the universe. I feel great everywhere I go. It’s just there are places where I had to work longer in one community, like in Brazil for example, that enabled me to connect deeper with the people. I go there twice a year. And when I go back, I really feel like I am in another family, you know, and I love that side of it. I love that part that you connect with the people in a way that you kind of know you will know them forever. AM: You have said in the past that it’s important for you not to have any sponsorship from a brand or commercial company. How would something like sponsorship affect your work, and why is that important to you to keep it the way that you have? JR: I think that’s it’s because my work is so visual that I don’t want people to misunderstand it. That it’s images that’s about people. That it doesn’t raise any other message in the art itself than the people’s message. So when people see one of my pieces in the street, they know it comes from me. It doesn’t come from a brand trying to pass them a message. And that is a real different way. Artists don’t realize that brands make them think a different way. They think they are thinking in the same way but they wouldn’t do something as extreme or political with the brand because the brand couldn’t allow that. So it’s a really tricky thing. Some artists do manage it and great, but I do believe that it’s a really unsafe position. For me it’s important to be independent, you know, manage it by myself or not. But there’s no other option. For me, I want the people when they see my work in the street they know that it’s 100% independent. That it’s there to be as a mark from a person to another person. AM: Then how do you finance your work? JR: I finance my work through the sales of my artwork in the galleries. So I produce only a couple pieces a year, and that finances the overhaul. I don’t have any other kind of financing. AM: Do you have any formal art training? JR: No, I never studied art. I learn by doing. You tried pasting, and it’s not that complicated. I guess it’s more about the energy you put into it and the dedication that you put into it than how good you are at doing the photo or how good you are in art. I didn’t have any knowledge when I started and I maybe even don’t have that much more today. And I feel good about it. I’m just learning as I go. When I discover an artist, when I discover something that touches me, I want to know more about it. But I’ve never studied art history to know how I should put myself into that story. I just create my own path and see where it fits. AM: What inspired you to do the Inside Out project? In the past couple of years, do you feel that you have achieved what you had intended to with the project? JR: It’s maybe a bit more than two years ago now, and it came from the idea that I saw so many people participating and helping in the projects that I wanted them to take control and ownership of it by letting them do the whole process. And so since I started Inside Out and I made it free and available to whoever wanted to participate in the work, a bit more than 140,000 people participated, in more than 10,000 cities. So that means it’s impacted millions of people, but in the way that they chose to. It means that sometimes, they decided to make it an art project and pasted on the school. Great. If they, like in Tunisia, covered the portraits of Ben Ali, the dictator, that’s political. It’s like a mirror society. Depending on the context of the place, it shows how people would use images to defend their own idea, or pass a message, or connect with their community. And it’s something that I’ve seen over the last 10, 13 years now, working myself in the streets that I’ve always wanted to share. But the only way to share it is to let the people do it by themselves. AM: Your documentary film, Women are Hereos received international attention during the Cannes Film Festival. Are you working on any more film projects at this time? JR: Yeah, actually there is one movie coming out about Inside Out, done by an English director named Alastair Siddons. The premiere is at Tribeca this week. It’s actually Saturday in New York, the big premiere. And it’s going to be on HBO also. It’s a big movie coming out about how people use Inside Out around the world. And then the other movie is a movie about Wrinkles of the City, because we’ve already shot it in Cartagena, Shanghai, Los Angeles, now in Berlin, and so we’re filming also about our project right now. And that’s a project that I’m doing. So that will come in 2015 I think. AM: What are some places that you haven’t yet been to where you would like to go and put up work? JR: You know I never really know what to answer to that because I’m kind of going wherever I want always. So I don’t really have places that I haven’t gone or where I want to go. I always live the present moment. When I want to go somewhere, I just go. So I guess there’s of course many cities that I haven’t seen but I’m not really stressed about it. I’ll see them sometime soon. Categories: Contemporary Art, Features, Interviews, Photography, Seen on Streets, Street & Urban Art. 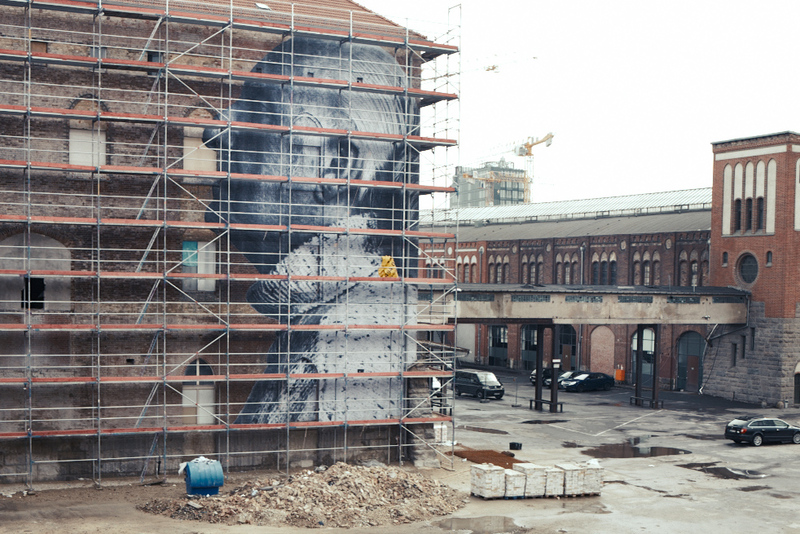 Tags: Berlin, Contemporary Art, featured, Features, Interviews, JR, JR - Berlin '13, Photography, Seen on Streets, slider-featured, Street & Urban Art, The Wrinkles Of The City.